Updated at 9:50 a.m. ET. 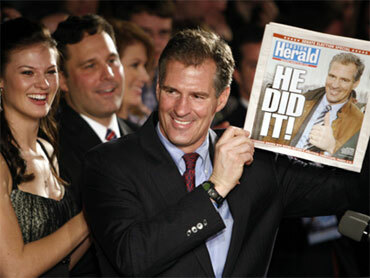 Republican Scott Brown's victory in the Massachusetts Senate special election is a repudiation of President Obama's health care reform package, political analysts, commentators and politicians widely agree. That assessment is that much more sobering for Democrats in light of the fact that Brown takes over the seat held by Sen. Ted Kennedy, who spent his life fighting for health care reform. Yet according to exit poll data collected by a private Republican firm, Politico reports, 42 percent of Massachusetts voters said they voted to help stop the Democrats' health care bill. "The symbolism of the rejection was difficult to overstate," wrote Paul Kane and Karl Vick of the Washington Post. "Kennedy, who held his Senate seat for nearly 47 years, served as a political mentor to Obama and was the patriarch of the Kennedy family's political dynasty." Brown said himself Wednesday that he does not see the election as a referendum on the president. Yet as he began his acceptance speech Tuesday night, crowds immediately began cheering "41," in reference to the 41st vote Brown will give Republicans in the Senate, enabling them to filibuster the health care bill. Brown quickly addressed the bill in his speech: "One thing is clear," he said. "People do not want the trillion-dollar health care plan that is being forced on the American people." Republican leaders said their obstinate opposition to the bill has been vindicated: "The voters in Massachusetts, like Americans everywhere, have made it abundantly clear where they stand on health care," Senate Minority Leader Mitch McConnell said. "They don't want this bill and want Washington to listen to them." Even some Democrats said it was time to rethink their approach to health care reform. "In many ways the campaign in Massachusetts became a referendum not only on health care reform but also on the openness and integrity of our government process," Democratic Sen. Jim Webb said. "I believe it would only be fair and prudent that we suspend further votes on health care legislation until Senator-elect Brown is seated." Massachusetts liberal stalwart Rep. Barney Frank said it would be wrong "to pass a health care bill as if the Massachusetts election had not happened." "If Martha Coakley had won, I believe we could have worked out a reasonable compromise between the House and Senate health care bills," he said. "But since Scott Brown has won and the Republicans now have 41 votes in the Senate, that approach is no longer appropriate." "If [Democrat Martha Coakley] loses, it's over," Democratic Rep. Carolyn Maloney said with respect to health care reform before the results of the election were known. Other Democrats, however, maintain the bill will pass. "We will have health reform regardless of what happens in Massachusetts," Rep. Charlie Rangel said. "We don't say a state that already has health care should determine whether the rest of the country should," House Speaker Nancy Pelosi said Tuesday night, the Associated Press reports. "We will get the job done. I'm very confident. I've always been confident." Special interest groups opposed to health care reform also seized upon the moment to press their point. "The overwhelming message from Bay Staters - traditionally one of the most liberal states in the union - is that government-run health care is on the wrong track," Rick Scott, chairman of Conservatives for Patients' Rights, said in a statement. Pro-reform groups, meanwhile, doubled down on their support for the measure. "While we respect the choice of the people of Massachusetts, the fight for affordable, quality health care coverage for all, including women's reproductive health, is bigger than any one election," Planned Parenthood Action Fund President Cecile Richards said. "We must rededicate our commitment to Senator Kennedy's goal. The most important thing we must all focus on now is moving a health care bill forward, the result of months of negotiations and progress toward ensuring affordable, quality health care for all." Service Employees International Union President Andy Stern acknowledged in a statement that voters are dissatisfied with the Democrats' performance over the past year. "But now, every member of Congress and the Administration must act with a renewed sense of purpose to show working families whose side they are on and deliver meaningful change to every American," he said. "This is not the time for timidity. It is time to show the courage and strength of conviction to move this country forward and bring working families the change they need. It starts by passing health insurance reform."